Due to the huge instrumental and vocal forces needed to perform it, the piece is nicknamed Symphony of a Thousand. The group is holding the workshop from 10am-4pm at the Crypt School, Gloucester, on April 27. Adrian Partington, director of music at Gloucester Cathedral, is running the workshop. Tea and coffee will be provided and scores are available either to hire or purchase. Booking is required if you would like to take part, with places £25 per singer. Forms are available from Jos Gregson ( 01454 411652 or jos@josgregson.plus.com or they can be downloaded from sccg.info. The SCBSG will be performing the work as part of the Cheltenham Music Festival in July 2020. Taking part in the workshop means you will be first on the list for an invitation to participate in the performance. The Guardian reported on the opening last week – read the article here. The Old Cryptians’ Club Centenary Bursary Fund is now set up to receive donations through the Amazon Smile programme. Once you have set up your Amazon Smile account, all future purchases will result in 0.5% of the price being donated to the Bursary Fund. The Crypt School’s summer GCSE results have placed the School in the top 5% of schools nationally for progress. The School’s Progress 8 score, that is the progress pupils make between KS2 (Year 6) and KS4 (Year 11) for 2018 is 0.65. That means that the School has added more than half a grade to each pupil’s expected progress by the end of their GCSE studies in Year 11. This is a wonderful endorsement of all the tremendous work carried out at The Crypt by both our committed staff and talented pupils. The Crypt School has achieved another set of impressive A Level results: 82% of grades achieved were A*-C, with an overall pass mark of 99% A*-E.
Notable individual successes include: Will Matson, 3 A* and 1 A; Austen Tulodziecki, 3 A*’s; Nathan Browne and Louis Staley, 2 A*’s and 1 A; Sam Berry, Callum Brignall, Seb Golding and Jack Greening 1 A* and 2 A’s; Harry Pearce, 2A*’s and 1 B; Henry Ip and Jacob Charles, 3 A’s; Jacob Wilson A*, A and B Jamal Farooq, 2 A’s and 2 B’s. 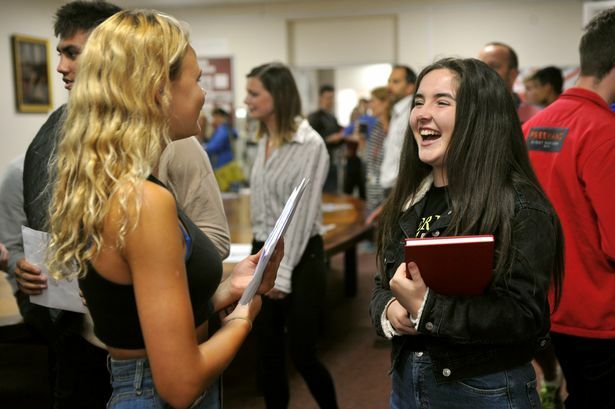 Nicholas Dyer, Headmaster, commented: “I am very pleased with the success of our Year 13 cohort, in a year when nearly all our students were studying the newly reformed A Levels. Their success is the product of both the hard work of the students and the dedicated support of their teachers. I am also delighted with the impressive set of university destinations that our students are heading to in the autumn and equally pleased to see a very good number of students who have now secured leading apprenticeships with local and national companies that combine work with studying for a degree.